In the eleventh year of the Sunscreen Film Camp, we are continuing with the pre-production week that was so successful last year. It's an optional week, growing from a two-week camp to three. Goal: to give actors more tools to produce realistic, yet evocative performances on film. Campers will practice focus and concentration. They will read scenes from screenwriting campers and take direction from teachers and student directors. They will practice scenes with active cameras placed in common positions and review performances. Campers studying film direction will get detailed instruction on how directors manage a project and work with others. More specifically, they will get practice working with two of film’s most important creative personnel: actors and writers. Curtis will also coach the young directors in the basic skills of managing the production of a movie. These include planning, scheduling, budgeting, editing and his specialty, cinematography. Actor, model and acting teacher Eugenie Bondurant lives in St. Petersburg. She is married to Paul Wilborn, the executive director of the Palladium Theater. She recently played the role of Tigris in The Hunger Games: Mockingjay – Part 2 . She is on the faculty of the Patel Institute in Tampa where she teaches acting. Bondurant got into acting when she started taking classes in Los Angeles while on a modeling job, joined SAG (Screen Actors Guild) and started getting small roles in TV shows, commercials and film. She is a cabaret singer, appearing in the American Songbook Series with husband Paul Wilborn and Blue Roses, and a founder of The Radio Theater Project. Eugenie is well-known as an On-Camera and Meisner acting coach. Curtis Graham is an Award-Winning Feature Film Director and Cinematographer. His Film Oloibiri recently won the Nigerian Academy Award for Best Film. With 100s of commercials for advertising clients around the world, Curtis Graham has created a diverse body of work as Director/Cinematographer. Raised in a photographic family, Curtis started taking pictures at age 15. He attended Los Angeles Art Center College of Design, which started a career in Advertising Photography. He has won many accolades for his work in advertising including: N.Y. Art Director, Norma, National Addys, and Clio Award, and his work has appeared in many national publications such as: Town & Country, Esquire, Print, and Communication Arts. His career in Advertising led to doing commercials for his Clients as a Director/Cameraman. Curtis went on to Attend The American Film Institute. At AFI Curtis received the Mary Pickford Award Scholarship. His Master Thesis film the “The Blue Men” starring Estelle Parsons went on to receive a Student Emmy and Academy Award. It is listed as one of the most award winning shorts of 1990. Curtis also received the Focus Award for Cinematography for “The Blue Men”. This allowed Curtis to pursue narrative work as Director/Director of Photography. Curtis is a former professor at UT and SE Universities. Campers will work to produce the scripts developed during Week One. Weeks Two and Three will follow the same path as the two-week session of the past eight years, but the campers will be armed with a week of skill preparation. 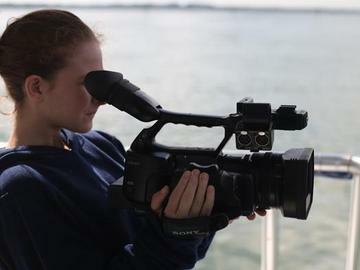 For nearly four days, campers will get a good overview of cinematography with industry experts using the same equipment the campers will be using. These experts will demonstrate shots and camera angles along with sound and lighting principles essential for good filmmaking. In addition campers will learn the basics of scheduling, locating and casting. The camp will then divide into production teams and shoot movies. They will have four days to shoot their movies and another three to edit, add music and credits. The completed films will be shown at a Sunscreen Film Camp Festival on the last day of camp, July 27th. In addition the movies produced at camp will be shown at the Sunscreen Film Festival in 2019. Kids ages 14-18. Some exceptions to age requirements will be made based on prior experience and interest level after an evaluation by the Sunscreen Film Festival staff. Please note: movie making is a collaborative effort in which each member of the production team relies on everyone else. Your child’s camping decision should be grounded in a genuine desire to learn the art movie-making. The camp day is from 9 A.M. to 5 PM. If you have family equipment, like a camcorder, and want to learn to use it more effectively, you are encouraged to bring it. Otherwise, Sunscreen will provide the equipment. The program was designed by Film Professor Dave Deborde and Festival Founder and Film Professor Tony Armer. Week One will be taught by acting instructor Eugenie Bondurant, directing instructor, Curtis Graham and screenwriting instructor, Tom Flynn. Weeks Two and Three will be directed by Mr. Graham, assisted by two college-age proctors who are experienced movie makers. In addition, guest speakers, like professional cinematographers and editors will also contribute. Campers are required to provide their own meals and snacks. Studio620 is in downtown St. Petersburg where lots of restaurants are within walking distance. Teams of participants will script, scout locations, shoot and edit as many as five films. They will present at their own festival at the end of the camp.